It is obvious that this way is the road to hell. There are men who fought for Russian Government in Chechnya. They were dying for something according to order. They seemed to have won. Have they? Years passed and now almost all markets, great part of restaurants and hotels in Moscow are being run by people from Chechnya. And the thing is, it is organized crime groups from Chechnya which posses that business. No Russians with Slavonic roots come to have business in Chechnya. But men from Chechnya come to the capital to get they consider they may. And they may everything. Government of Russian Federation leads the politic of equality for all nations. But it is just a moto and has nothing to the reality. Equality turned to be a conquer of Russians by Chechens because men from Chechnya are allowed much more than guys from towns and cities of all the rest Russian territory. Everyone lives in fear to have a deal with men from Chechnya. If someone says he doesn’t, dont you believe him. He does. Putin pretends he likes Ramzan Kadirov, he pretends he loves him like a son. Each of them knows his own role very well. The Games of Throne is a light children’s version of the Kremlin Game’s reality. I always was wondering for how much does Putin pays to Kadirov for the Chechnya’s obedience. Winner pays contributions. Aren’t those relationships strange? Yes, they fuc*ing are. Or else it’s just a joke. And Putin is just a comedian. Bad comedian. What if all his strategic steps are just for fun and all of us are both participant and viewer of a great hoax. Did you know that American stand-up comedian show Comedy Club was successfully implemented in Russia and has been shown on TV for a long period? 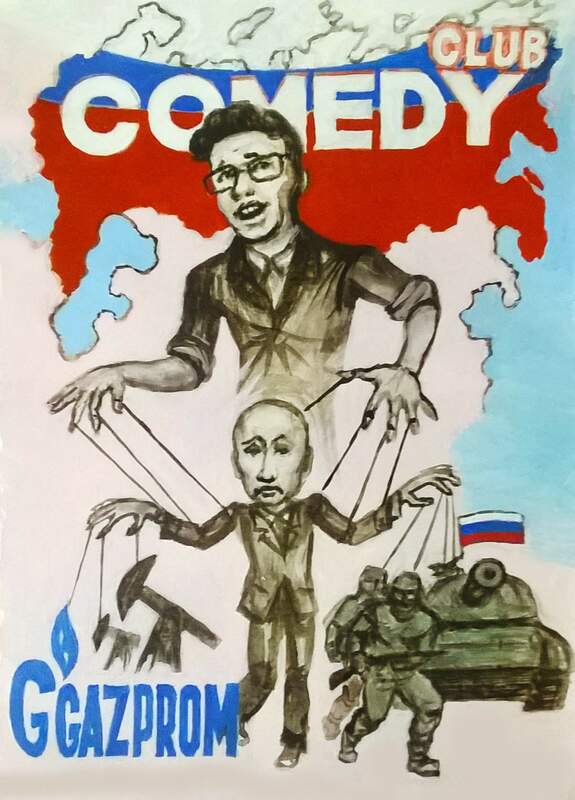 And of course comedians in Russian Comedy Club are native from Russia. One of the main actor and comedian of Russian Comedy Club is Garrick Bulldog Kharlamov. Actually this person had become such a famous star that President Putin invited him to be a helper in previous election campaign. In one of his agitation video Garrick was joking about his being not educated in fields of economy and politician. He admitted himself being a crotcheteer but not qualified manager. «Everybody will walk with umbrella above and croak if I become a President», — said comedian. And of course he recommended voting for Putin as a professional in governing. That video was hardly fun. Well, does the governing have something to deal with merry-making? I thought it wouldn’t. I thought that time when it was possible had gone. The time of stupid, selfish and bloodthirsty kings was left behind. Seemed to be. Alas. This time a man of motley has outdone himself. This time Garrick Bulldog Kharlamov was the one who nominated Putin as a candidate for the presidency. Well, of course he was not the only one. He was one from a group. Howbeit, it becomes harder and harder to differ whether a man of motley is a resident of Putin’s teem or whether Putin is a resident of Comedy Club. It looks like the whole Russia has been somehow turned to one big Comedy Club. Filled with jokes over veterans of wars, jokes over political rivals, jokes on the whole people. Let’s have a fun together. Сколько из этих ошибок допускаете вы?